Weight Gain: 0lbs… and somehow this feels like an accomplishment! 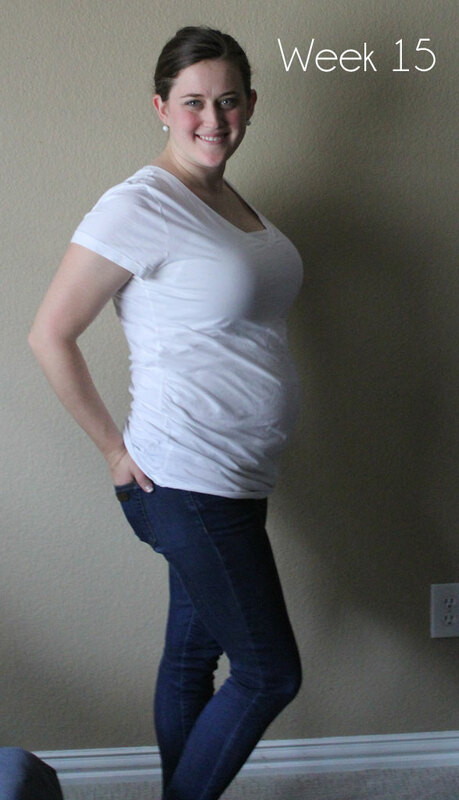 Back to my starting point… although part of me is wondering what that whole bump thing is made of since I haven’t really gained any weight, but DEFINITELY look pregnant! Sleep: Other than my nightly trip to the bathroom, I am sleeping pretty well, although I can tell that rolling over to the other side is going to be a huge chore in just a few short weeks/months, so I’m trying to enjoy the sleep while I can! Favorite clothing item of the week: definitely the black dress pants (these from Loft) because I love the combo of petite pants for my short little legs and the awesome stretchy band to hold them up. Although I’m sure I’ll get tired of them by the end, I’m a fan right now! Symptoms: Right now my only real symptom is that I tire out much faster than I used to… I’m hoping a little exercise in my future will help with some of that, but for now I’m just trying to do what I can do! Workout: I bought a new DVD… does that count? I plan on starting it this next week, so hopefully next week will have a more productive answer for this question. Yeah! I am so glad you are feeling better, Thank you for these awesome updates. Since I can’t be with you everyday (this needs to change) I love that I can read these updates. Let me know if you need anything!